Three primary areas have been targeted as part of the Action Plan for Air Pollution Prevention and Control, released by China's State Council as a result of various air pollution incidents months prior. These areas are Beijing-Tianjin-Hebei area (Jing-Jin-Ji), Yangtze River Delta (YRD) and Pearl River Delta (PRD). Based on the traits of each province, different outcomes have been expressed for each to achieve as a result of this plan. In Beijing, the annual average PM 2.5 concentration should be reduced to 60ug/m3 level. However, these are still far off the estimates of PM 2.5 concentration by the National Ambient Air Quality Standard, which is 35ug/m3 to be reached by 2016. This is in contrast to the preferred 60ug/m3 which is set for Beijing in 2017. To sustain a 10% growth, China has relied upon stable energy consumption, with coal constituting 68% of 2012's power usage . With this, plans have been introduced to install equipment to reduce nitrogen oxide and sulphur dioxide(prime causes of PM 2.5 particles) and close various coal-fired heating systems. China will attempt to reduce coal consumption to 65%, with most of the demand filled by natural gas, a much cleaner fuel source. 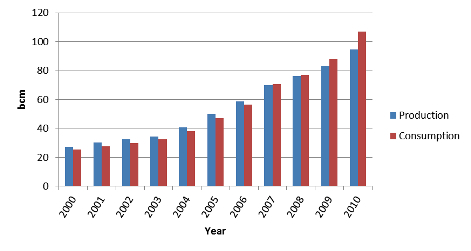 Figure 2 shows the growth from 25 billion cubic metres in 2000 to 100 billion cubic metres by 2010, effectively quadrupling the reliance on natural gas in 10 years. This has also resulted in China requiring imports to sustain their usage from 2007. This growth has primarily been as a reaction to the air pollutants and will continue to rise as cleaner fuel sources become favoured. In conjunction, heavy polluting vehicles will be phased out by 2015, primarily entailing those notated as 'yellow label' vehicles. In 2014, this was planned to push 5 million cars to be scrapped in China, with more than 300,000 of those within Beijing . To compensate these drivers, a payment of 2500 to 14500 yuan will be distributed. This, along with the cleaner fuel plans shown in Figure 1, will aim to slowly reduce the pollutants emitted by and the frequency of the motor vehicles, which account for 31% of PM 2.5 particles. Furthermore, this has encouraged the creation of action plans in both the Beijing and Hebei regions: the Beijing Clean Air Action Plan and Hebei Implementation Scheme of Action Plan of Air Pollution Prevention and Control. A heavier emphasis on clean energy run vehicles. By 2017, 200,000 new clean energy vehicles will be deployed, attempting to reduce fossil fuels powering only 30% of vehicles. 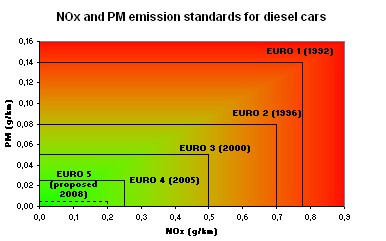 Figure 3.1: A graph expressing the maximum PM 2.5 (particulate matter<2.5um) particles and nitrogen oxide levels for each European standard in diesel vehicles. 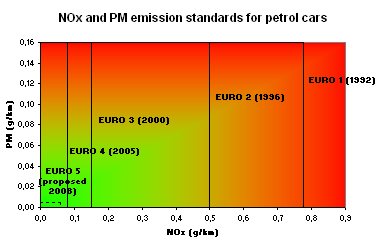 Figure 3.2: A graph expressing the maximum PM 2.5 particles and nitrogen oxide levels for each European standard in petrol vehicles. Note there is no limit for PM 2.5 particles until Euro V.
However, despite the seemingly successful scheming of these policies, they each encounter various flaws and risks that could be detrimental to their respective successful completion. Primarily, while the Action Pollution Prevention and Control proceeds to detail the required reduction of emissions for each region and province, this is ineffective without the support and acknowledgement by each local area. This flaw, however, has mostly been phased out by the introduction of Heibei and Beijing's plans as a response, but other cities may be less affected and incentivised to reduce their air pollutants, despite the monthly release of the 10 best and worst cities in terms of air pollution. Even the consideration of air pollutant reduction into the evaluation of the province leaders, only encourages that single person to take action, not that state as a whole. In addition, the aims for vehicle improvement are almost impossible regarding the current state of oil companies that hold power. Twice, the implementation of European IV quality vehicles has been delayed due to the inability for oil firms to willingly upgrade to European IV grade, with the extra cost being a heavy deterrent. In addition, the extra cost is not offset, with the China government controlling prices and unwilling to raise them. This forces these companies to bear the brunt of the cost, creating these delays, as their political prowess allows them to challenge the weak environmental ministry. The result; an 18 month late introduction of standards, from 2011 to July 2012, ruining the centrepiece of China's Action Plan. In reference to the criteria, these Actions Plans in China and its provinces have been reasonably effective. It addresses the long term by setting a strong base to continue on into the future, whilst also meeting pressing needs in the present. The reduction of both coal and vehicle emissions are viable solutions, since they contribute the largest towards the air quality deficit. Furthermore, the delegation of power towards province leaders allows the areas to carry out their plans effectively based on their specific demographics, in much the same respect to the differing PM 2.5 reductions for Jing-Jin-Ji, YRD, PRD and the rest. However, despite these, the lack of cooperation from oil industries could be detrimental, especially since the government is unwilling to heighten petrol prices to compensate. The higher prices would result in the burden being weighed by the population, upping the cost of daily life. In conjunction, the subsidies paid for the scrapping for vehicles seems excessive considering the quantity of vehicles. In 2012 alone, it is expected around 5 million will be disposed around China. Affecting the entire population for those who own sub-par vehicles could be recognised as unfair and detrimental to the progress of the country. As such, we can gauge that the action undertaken by the governing bodies have been quite effective, but these unexamined consequences mentioned above could be detrimental to the success of these policies.